Ive just acquired a few vintage bits and bobs and have got what i believe is an RLL HDD, model is an NEC D5655, so this is a whopping big drive for its day. Although seeing the date on the drive and controller as 1990 i thought it seems a bit outdated for even that time, as its a 5 inch disk and ive seen older IDE drives that still used stepper motor heads, and this is a voice coil unit. Anyway, i need to find more information on the make and model of the controller card, all i know is that its made by data tech corp (DTC) cant find any info on the net regarding this, and when i googled the code on the ROM sticker, that seems related to western digital controllers. The drive and controller are still connected and were in a box labelled removed 1998 along with the name of the business the computer was from. Anyway, i dont know what any of the DIP switch settings are for, but i assume all was working at the time it was removed and some collector who had all this stuff i got carefully labelled everything in these boxes and was told it was all working at the time. I was trying to make this work on a later 486 motherboard ive got which has no onboard IDE or floppy controller. Ive never had any experience with these drives before, so i dont know if im doing everything correct, but having the controller connected to the motherboard, the system no longer gave me a HDD controller error, so i assume its detecting it. I entered the CHS settings into the cmos, but it does not seem to be reading the drive or attempting to boot from it. The HDD light at the front of the drive stays on the whole time, so that usually means its not configured correctly. Thanks for any information regarding this. I believe people have been able to get these controllers to even work on later pentium machines if the IDE is disabled on the motherboard, so am interested to see how others have got on with these. Ideally i would use this in an older 286 or even an 8086 system perhaps, i dont have any floppy controller cards, so its not much use to me on its own in a 486 system, but i want to see if the disk is readable or still had a bootable OS on it. I think it's most likely you actually have an RLL 26 spt controller on your hands, gives a boost to storage and performance. Drive manufactures would tell you to use special RLL approved versions for an extra price, but it was pretty common to just use normal MFM rated drives without problem. Those NEC drives were mostly made between 1988 and 1990, they're very reliable units. A 60MB RLL setup in 1990 on a DOS setup would've probably done just fine. Anywho assuming these came as a matching pair it should be plug and play - provided the drive is still able to read it's original format, and there is no conflicting hardware (such as primary IDE). Since it uses a high IRQ, it wouldn't be suitable in a PC-XT but perfectly at home in a 286. I run a 30MB RLL system in my IPC AT 286-8. If you set the BIOS drive type - either set it to disabled or type 1 (10MB), because that Boot ROM (if enabled) should be taking care of business. If disabled doesn't work, try type 1, I've had a few situations with RLL and ESDI controllers where if it was disabled in the BIOS, then they wouldn't start their internal ROM, no idea why. Which will hopefully be followed by a program loading up - if nothing happens or the system goes nuts, you could repeat and try :6 instead or trying CC or D0 or D8 etc. Doing this will blank the drive, but the fresh format should be good for another 20 years. Follow it up with some FDISK and some FORMAT C: /S and you should be away. Sorry for long post, just wanted to throw lots of information out there, that way when you go to mess with it again you've got more info to use against it. OK, thanks for that info. I had tried disabling the HDD in the CMOS, as i since have learned that this is only for an IDE controller. I will try and have another go setting it to type 1 10MB as you suggest and see if that helps, but yes i think i will need a DOS bootdisk with Debug to see if i can communicate with the card. You mention a boot ROM on the card, i have been reading about this. The card in your link looks similar to mine, i will check if my board has the same jumpers, im pretty sure i only have a DIP switch. Im not going to change any settings on the card, but i may try to enable the BIOS if it has been disabled. Some sources say it should show on the screen when the computer starts up, i also read that some controllers require you to run their own setup program off a floppy to configure/format the drive etc, and others say that you use Debug as you have suggested. Again, all this is new to me, but hopefully this will give me enough info to have another crack. OK, here is an interesting update, i fired it up again today and this time the bootROM loaded with its message flashing up on the monitor. Didnt do this the other day and i never had to change any CMOS settings to make it work either. Really weird, but perhaps just related to lack of use since 1998? It boots up dos and then starts windows 3.11, the first time it had an error message with a file missing when loading windows, and after rebooting and trying again i was able to get into windows. Could this be what you are suggesting about needing a LLF? Can the magnetic media deteriorate when sitting for years of no use? I wonder if any other issues can arise due to no use? I know im not having any stiction issues, but what i do notice is that the red LED on the front bezel stays on 100% of the time. 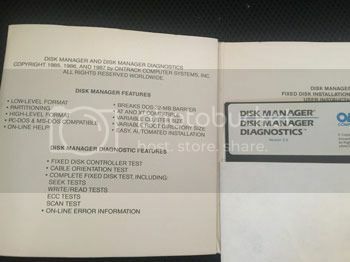 Ill try to preform a LLF with the disk controller itself if i can get it to work through debug, but ive read alot of good stuff about disk manager that apparently was widely used back in the day, its supposed to have all the configuration data for all of the common drives in its day. Have you or anyone else here used this before? Great to hear it's booting! Windows 3.11 is a bit of a surprise, I guess someone was really putting off an upgrade. The file error could simply just be a software issue, if more and more files start disappearing then that can be a sign an LLF is due. Normally I find it occurs in the most used parts of the disk - annoyingly this tends to be bits of the file allocation table. The data is regularly rewritten and the signal nice and strong - but the sector markers written at the factory have just been read thousands of times and eventually lose strength. I'm no scientist, this is just my experience. Use and time both seem to effect it. Often I get machines arrive here that've been in storage, and find a drive only boots a few times before it starts quickly deterorating - an LLF fixes it completely. 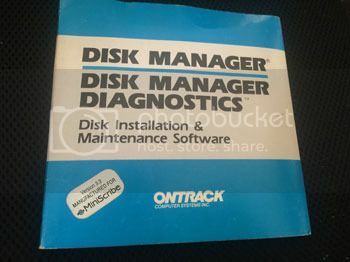 Disk Manager was often handed out with hard drives, was the free program you often got. I much prefer SpeedStor and consider it (personally) best in class. Some controllers "latch" the drive - so the light will show you what drive is currently selected, rather than just activity. On some controllers it's one way or the other and some give you a jumper to change how it's used. For your case, your HDD LED should actually connect to that 4 pin header on the top left of the card - that will always show activity. Feel free to ignore this last bit, I just wanted to have a quick blab about how your PC knows how big the hard drive is, so you can see what I mean more clearly about writing the config record. 4) MBR - computer CMOS is set to the wrong type, but a program in the first few sectors of track 0 updates the parameters before DOS starts (some versions of Disk Manager, SpeedStor, Anydrive can do this). Option 1 doesn't need a ROM, however it's a pain on a 286 or similar that doesn't have a custom drive type. Often used with generic MFM controllers. Option 2 doesn't apply in this case. Often found on early XT controllers. Option 3 is what it's currently using, and what the ROM program will continue to use - Often found on late XT controllers, and AT RLL and ESDI cards. Option 4 is annoying because if you boot from floppy you can't read the hard drive, it's also possible to accidentally erase it since it's not hidden from the OS. So for yours, it's ideal for Option 3 to keep working so you can slap it in to any ISA based machine and start up without any downsides, but to keep that you'll need to use the ROM program or do a non-desctructive LLF I mentioned earlier. Video is terrible, need to redo it, but meh. You'll probably want to use an interleave of 1 if you do decide to do a full blank LLF (generally I use 1 on AT's, 3 on Turbo XT's, and 5 on proper XT's). Yes its probably better i do an LLF through debug using the format tool on the ROM. Never done it before, but looks easy enough. I always get lost when it asks for interleave etc, so thats helpful thanks. I know what the CHS are from reading the info that is amazingly on the NEC website. The drive still has the factory defects printed on a piece of paper in a plastic sleeve attached to the drive. Ive read you had to manually enter these when performing a LLF, but i thought the whole idea of a LLF was to scan the drive and map out all the bad areas of the disk is it not? The LLF is really just blanking the drive and most importantly rewriting the sector "markers" etc so that if you write data to track 3 sector 4, the drive/controller can actually find that sector. Similar to what happens when you format a floppy disk. Some routines do a verify for bad blocks, some don't. Tools like SpinRite can do thorough testing, but 95% of the time I find MS DOS format does a good enough job of finding the dead ones for hobby use. The factory defect list may not be of use, because I think - (I haven't looked it up) your drive was originally intended for 17 sector per track operation (40MB formatted) and is being run as 26 sectors per track (60MB) - if that's true, then the numbers on the top of the drive aren't going to match anymore. And yep, you generally do enter these manually, but I rarely bother. Might be worth running CheckIt or MSD (part of MS DOS 6) just to see what the computer thinks it has, vs what NEC says the drive is. If you do get the DTC formatter up on screen, I'd be curious to see what it looks like [even if you don't do a format]. I got the format program up, c800:5 worked for me. Ill post the screenshots in the morning for you. Do i have to park the heads with these types of drive, or is it only an issue with stepper motor drives? hah, I was writing out how to check if it auto parks, then quickly googled the model number to make sure you had the normal NEC seek wheel. I should've done this sooner If google is accurate, you're not dealing with the normal RLL/MFM type gear - it's ESDI. If the drive is showing up as 150+MB with over 30 sectors per track, it'll confirm it. From the model number I had assumed this was the higher capacity version of the very popular 20MB MFM unit. ESDI uses the same connectors as the older standards, but it's a different beast. Faster and smarter, but lacked the simplicity/flexibility SCSI or IDE provided. All of my ESDI drives autopark, but I don't own this specific model so can't be 100% certain. On power off you may hear it move the head to an outer track, if it does this then it certainly auto parks. SpidersWeb wrote: hah, I was writing out how to check if it auto parks, then quickly googled the model number to make sure you had the normal NEC seek wheel. I should've done this sooner If google is accurate, you're not dealing with the normal RLL/MFM type gear - it's ESDI. If the drive is showing up as 150+MB with over 30 sectors per track, it'll confirm it. Yes very interesting regarding ESDI, i did read a bit about this earlier last week, never heard of it before until then. I initially thought my drive cant be ESDI, because of the different connector that i saw in a photograph but ive now learned that this was an IBM connector called the direct bus attachment. Anyway, i still was unsure if my drive is ESDI or not, some sites say it is, others say RLL. It says the interface is ESDI, but still says RLL recording method. Im a bit lost here, what is the usual interface called for a standard MFM or RLL drive? My controller card is listed as an RLL card, but i suppose it must also support ESDI for it to control my drive? I have not done a LLF yet, but here are the screen shots for your interest. The confusion happens because MFM and RLL are really terms that actually describe the encoding - RLL2,7 was used on ESDI and IDE and many SCSI drives internally too. From a hobby/user perspective when we say "MFM" or "RLL" - it generally refers to old ST412-style interface drives [which never really got an official name] - a few company's started labelling the connectors as "WINCHESTER" but even that term wasn't really unique. I'd treat the card as ESDI only, I haven't seen any that allow the older interface. ESDI is rare here, so it's a good find. Whenever I've needed ESDI parts, I've normally had to get them out of the US. SpidersWeb wrote: The confusion happens because MFM and RLL are really terms that actually describe the encoding - RLL2,7 was used on ESDI and IDE and many SCSI drives internally too. From a hobby/user perspective when we say "MFM" or "RLL" - it generally refers to old ST412-style interface drives [which never really got an official name] - a few company's started labelling the connectors as "WINCHESTER" but even that term wasn't really unique. Ok, that is useful to know. Ive learnt lots already in the short time since i joined this forum. So really there is no special "interface" its just improvements on the drives encoding? For the old "ST412 interface" type drives that's correct. To run a drive in "MFM" or "RLL" encodings you needed a different controller card, but the interface was identical. Because it was identical, you could mix and match these drives/controllers, it was quite common to grab a cheap MFM drive and use it with an RLL controller to get a 50% boost in storage and performance without paying an extra - much to the dismay of hard drive manufacturers. The naming came about because you basically had a "PC with a hard drive", and then a new controller came out that used RLL which was more efficient, the old drives used MFM encoding so they got referred to as "MFM" and "RLL". Both used the same interface which was really a high-speed glorified floppy interface with a few extra pins and some changes - the most notable feature being "buffered seek" which was added when the 10MB ST412 came out [used in the original PC-XT]. ESDI, IDE, SCSI etc are actually different interfaces. Generally using RLL or a variant of it for actually writing data on the media - with IDE/SCSI that's all managed internally. Would've been bundled with a Miniscribe around 1988ish I imagine. LOL, that is a good laugh! I dont really know what system i will put this drive into yet, ive got a handful of 486 and 386 motherboards, but feel it would be better placed in an early 386 system or a 286. At least i know its working anyway.